If Highway US2 is your chosen route over the Cascade Mountains, you are bound to slow down, with a lot of head turning, as you pass the town of Leavenworth. In fact you will probably come to a complete stop, to more thoroughly enjoy the spectacle of a classically Bavarian-styled village in its alpine setting, complete with Tudor-work, window boxes and medieval decorations. The sight is a welcome respite from the usual architectural designs and signage seen from the highways. Even the gas stations are in on the act with their prices per gallon announced in gothic lettering. 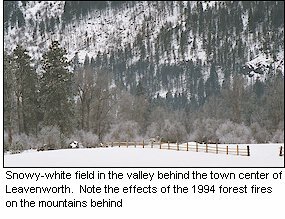 There is nothing historically "Germanic" about Leavenworth; what you see here is all about visual association. Local business people looking to revitalize the town were reminded of villages in Germany, situated like themselves, against a backdrop of alpine mountains. And so the small timber town was transformed - visually and economically. Decades of redevelopment, which still continues, has been done with an eye to detail and quality, avoiding the pitfall of cheap kitsch, and achieving a very picturesque town. Leavenworth is a piece of unabashed fantasy, and if you accept this town in the spirit with which it offers itself, the experience will be an enjoyable one. If browsing through gift shops is your thing, allow an easy day to get through them all. Along with a selection of quality arts and crafts, Germanic gifts fill the specialty shops. You will be in seventh heaven, if you are a collector of beer steins, cuckoo clocks or nutcrackers. If you are new to the nutcracker game, marvel that a good specimen might set you back anywhere between $60 to $6,000 dollars, and that nary a nut will be cracked by these valued ornaments. In the music box shop, be sure to ask for a demonstration of the huge rosewood grand-daddy of music boxes - the sound is quite remarkable. If by now you have worked up an appetite, you can seek out a dining experience of sauerkraut and strudel, consumed to the hearty rhythm of German folk music. There is also large assortment of restaurants offering non-German fare. Beyond cuckoo clocks and curlicues, it is more than possible to get rugged and work up a sweat in the vicinity of Leavenworth. A 2.5-mile loop, accessible for walking in summer and cross-country skiing in winter, goes through Riverfront Park, Blackbird Island, and Enchantment Park. The trailhead is south on Ninth Street. In winter, the trail is extended with groomed cross-country skiing trails on the golf course. You will find these trails are shared by a population of deer. The town makes a comfortable base from which to explore the surrounding mountains encompassed by Wenatchee National Forest. Get details on more hiking, or cross-country skiing opportunities from the Leavenworth Ranger Station, the Wenatchee Forest Service Ranger Station, or the Leavenworth Visitor's Center. Other outdoor services abound. In summer go white water rafting. In winter take a sleigh ride, or try out the Leavenworth Ski Hill. Exploring the surrounding valley need not be a strenuous task. It is well worth driving beyond Main Street with its shops, to take in the scenery behind the town. (See map.) On US2, drive west of the town center, and take Icicle Road to the south, past the renown Sleeping Lady Conference and Music Center, and at least as far as the National Fish Hatchery, which raises chinook salmon. The road continues into the forest where there are about 8 campgrounds. Turn back, then drive along East Leavenworth Road for more scenery. Around the township you will find some fine private residences. As encouraged by local ordinances, some continue the Bavarian theme with panache. Nice examples can be found along Alpensee Strasse off US2 past Alpine Rivers Inn. As if all this weren't enough, Leavenworth strives to entertain its visitors. The focal point for activities is Front Street Park, which functions like a European town square. If your timing is good, in summer you will see marching bands, arts and craft shows, concerts in the Bavarian bandstand, storytellers, or strolling musicians. In winter you might see ice-carving, or a dog sled competition. On the snow covered version of the park, we found families out with their toboggans on the small slope until way after nightfall. To make Leavenworth a part of your experience you might take a break here after traveling eastwards over Steven's pass. Or perhaps stay overnight in order to travel the Pass in daylight hours when going westwards to the coast. See our suggested driving tour. There are plenty of lodgings in and around Leavenworth, but be sure to book ahead in summer, and holiday weekends.